Travelling to Taiwan with a baby sounds like a new parenting challenge! Months before we welcomed baby V, we were toying with the idea of travelling after the confinement period. But after she arrived, we couldn’t bear to leave her here in Singapore while we were miles away. Eventually, we decided to bring her along and my parents as a support team. LOL. Proper planning is definitely required especially when bringing a baby overseas. For a checklist on what and how to pack the luggage, our previous article might help ease those nerves. We had about 7 days in Taiwan and our route was: Taipei > Taichung > Cing Jing > Taipei, approx. 2 nights at each area. Baby V making sure that our luggage get checked in! Almost 4 hours later, we arrived at Taipei International Airport, hopped on the shuttle bus headed for the Taipei High Speed Rail (HSR) Main Station (there’s only 1 bus that goes there! Get tickets from the right counter.) where we were due to take our pre-booked train ride to Taichung. Journey to Taichung takes about 30minutes by the High Speed Rail. We booked the Business Class seats as my parents wanted a more comfy ride. It was definitely more spacious, chairs are bigger (2-seater instead of 3-seater at Economy Class) and drinks (choice of juice, hot tea, coffee, water) and a small cake was served. Our cheeky little girl is obviously very excited though she doesn’t get her share of tea, coffee or cake.. oops! Notice the overhead compartment also allows strollers or luggage to be placed. Those roller types will be parked at a luggage area pretty near our seats. Upon reaching the Taichung station, we headed to the McDonald’s at the station to meet the local driver uncle who was to send us to the hotel. Journey to Beacon Hotel took about 40 minutes but the ride didn’t seem that long as the traffic was pretty smooth in the evening and it was a 7-seater (yay!) so all’s good. Despite it being our first time travelling to Taiwan with a baby, my energy level shot up instantly upon discovering that Feng Jia Night Market was literally at our doorsteps! REJOICE!! We checked into the room, freshened up baby Vera and scooted out pronto – that explains the lack of pictures of the room… LOL! Hotel rooms in Taiwan are usually “just right” or sometimes less spacious. With a king-sized bed plonked in the centre, a mini fridge, full height 2-door wardrobe, 42″ LCD TV, toilet amenities with glass-doored partitioned shower area and a study table + chair; we couldn’t ask for more knowing it’s going to be a place to snooze re-energize. Baby cots are available upon request during booking, and the room came equipped when we entered. Only to realize it became a white elephant because baby Vera has been co-sleeping with us at home anyway, what more with a King sized bed now! The attentive folks at the reception asked if we needed a bathtub too, so do note to request from them if you’re planning to travel to Taiwan with your baby. It was a simple Combi bathtub, good enough but just be careful if the baby is learning to crawl or likes moving around as it does get slippery in there if you’re used to using a bath mat or other accessories for added friction. Feng Jia Night Market is hailed as a must-go place when visiting Taichung, and prices are presumably cheaper compared to Taipei city. It covers a pretty big area and there were several food stalls with long queues (especially the 大肠包小肠 stall that was just next to the hotel. Hub immediately proclaimed that he was going for it! ), and we noticed quite a few strollers being pushed around. We opted to skip the stroller and simply put Vera into our carrier since it was already night time when we arrived and we weren’t planning to stay out too late. We were glad about this decision because it freed up our hands when we scouting around for snacks and munching them as dinner. With a carrier, it was also easy for me to nurse her on-the-go whenever she needs. Hub loves kong bah bao, so when he saw this, it immediately caught his attention. Choices of fillings such as chicken, pork, beef and sauces such as thai sweet chilli, black pepper, etc. Bear Paws spotted at Feng Jia Night Market in Taichung. We had Oyster Omelette that came with kangkong. As I’m still nursing, i don’t really take much seafood. Actually, I’ve been cutting down on seafood since pre-pregnancy days and throughout pregnancy due to cholesterol levels. So all that crunchy kangkong was mine!! We started the day with breakfast at the hotel’s café and baby V had her share of plain porridge from the buffet line. Seeing that we were all eating, she felt left out I suppose. So we put her on the high chair and took turns “entertaining” her while we gobbled ate. Breakfast spread at Beacon Hotel. Waking up to breakfast at Beacon Hotel. 1 meal sorted, making it easy when holidaying in Taiwan with baby V.
Hmmm, coffee jelly for breakfast? Beacon Hotel folks are pretty creative, haha! It’s Fried Kway Teow here. Doesn’t look very appetising, huh? The usual guys at a regular breakfast buffet spread. Baby V having her brekkie of plain porridge. We brought along these Summerinfant disposable bibs, and they are really handy! $8.90 for 20pcs from Mothercare Singapore. After breakfast, driver uncle came to pick us at the lobby and we discussed the itinerary for the day. First stop was a store to get the “best Tai Yang Bing (Sun Cakes)” as he proclaims. They were very generous with samples and gave each of us a full piece. I tried them but wasn’t too impressed, so I didn’t get any and I obviously didn’t remember its name either. Oops. We rented a baby car seat and baby V attempted to lick the seat belt area (covered by blue hankie) a few times cos it was right at her mouth level. Along the way to Miyahara Eye Hospital, we stopped by Hong Rui Zhen Sandwich as driver uncle was sharing that it was popular among the locals for its fresh and soft sandwiches. They have only one store in the whole of Taiwan so we bought some to try. Our verdict: tastes soft and fresh but a tad sweet for me. Trying sandwiches from Hong Rui Zhen in Taichung. Have you eaten them before? What was the verdict for these Hong Rui Zhen sandwiches? Read to find out! Before we decided to travel to Taiwan with baby V, I did some research on what to see/do at Taichung. Interestingly, Miyahara Eye Hospital (宮原眼科- Gong Yuan Yan Ke) came up, and it looks too pretty to miss! With a unique story proposition like being converted from an eye hospital, and turning it into a spanking new snacks boutique with pretty packaging. They are part of Dawn Cakes, the same team who are famous for pineapple cakes and the works. But at the eye hospital, packaging sells. There’s a sit-down restaurant on the second floor, so if you’re planning for a date or high tea, this can be a nice option too. Let the pictures tell you more! Look at that building design! Bet you can’t tell what’s in there! A popular tourist attraction, Miyahara Eye Hospital sees swarms of tourists daily! Vintage meets modern appeal at the Miyahara Eye Hospital. Can you guess what they’re selling? WOW! Mooncakes? How pretty are they! Pralines? Dark chocolate? Take your pick from all those sweet treat at Miyahara Eye Hospital. MORE chocolate for the sweet tooth! These pretty tubs at Miyahara Eye Hospital look like skincare products… but are they? Look closer! These make perfect gifts, don’t they? Very smart of the Miyahara Eye Hospital team! Look at those slabs of chocolate with a variety of flavours! If you’re visiting Taichung, mark this place. MORE pretty food, with equally beautiful boxes. Taiwanese are really meticulous when it comes to details! The grandeur of Miyahara Eye Hospital – decorative fixtures spotted. Are those books at the eye hospital? Have a closer look! The place looks somewhat like a TCM shop with their multiple drawers. Getting gifts for family and colleagues is easily sorted at the Miyahara Eye Hospital. HA! Facing the walkway, this area sells tea leaves in various flavours. Only managed to snap a shot of the toppings area near the payment point. The ice cream flavours area was crowded with people in the queue and it wasn’t convenient for me to squeeze in, with baby Vera nursing in the carrier. Look for this sign, and you’ll see the ice cream palour in there! Next stop: Xin She Castle (新社古堡). There’s a Lavender Cottage (薰衣草森林) that some tourists recommended too but my mum isn’t too much a fan of flowers and grass (as she claims), so we skipped that. Along the way to Xin She Castle, we swung by Dong Dong Yu Yuan for yam balls and sweet potato balls that drive uncle was raving about. Seems like there’s only one of this shop too, and apparently popular with the folks in Taichung. Looks like Blackball, right? Haha, it was so filling. That’s the shop with green signage! Xin She Castle is at an open space area with a mini man-made waterfall too. But the weather was scorching, so it wasn’t too enjoyable. Baby V’s Mustela sun protection cream was easy to spread and didn’t leave unsightly white patches on her skin. It didn’t really feel sticky too, so that was a good thing! For adults (okay, basically I was the only one who bothered to apply sunblock), Biore Super UV Milk was light on the body’s skin, spreads easily due to its watery nature and seems to turn slightly powdery, without a sense of stickiness. On my face, Aqualabel UV Milk (bought from Watsons Singapore) was watery and spreads with no fuss, but it seemed to give me a tinge of white on my face/pearly effect, so it made me look whiter according to Hub. For mummy: On my face, Shiseido Aqualabel White Protect UV Milk SPF 30 PA++ and on my body, Biore UV Super UV Milk SPF 48 PA+++, bought in Taiwan for almost half the price in Singapore cos of their summer sale! For baby V: Mustela Bebe/Enfant SPF 50 Very High Protection, bought at Takashimaya. Baby V has eczema so we try to take precaution, especially for the affected areas. We toured the area in under an hour and took some pictures. Skip the gift store – the items are from different parts of the world and tagged with high prices. The entrance ticket comes with vouchers to offset your purchase (I think it was TWD$100?) but nothing was priced at that value and we couldn’t find anything worth buying so we walked out in 5mins. That hat didn’t stay on her for very long… lol.. Oh and we bought it from Mothercare before our trip. After we returned, we saw it on a 50% discount! Sad. A family photo snapped at Xin She Castle for keeps! Enjoying the serenity of Xin She Castle at the lake. Beautiful swans were also spotted idling in the calm lake at Xin She Castle. It was nearing noon, so driver uncle said that he would bring us to dine at their popular mushroom eateries. Apparently, that whole stretch of road houses various restaurants that focus on mushrooms. Interesting to know, because many of them have their own mushroomy farms so it’s basically hort (hot, geddit, geddit??) off the soil! We were a tad disappointed with the place he took us to, as it wasn’t like anything he had described. We had a steamboat of mushrooms and veggies, stir-fried veggies and meat. 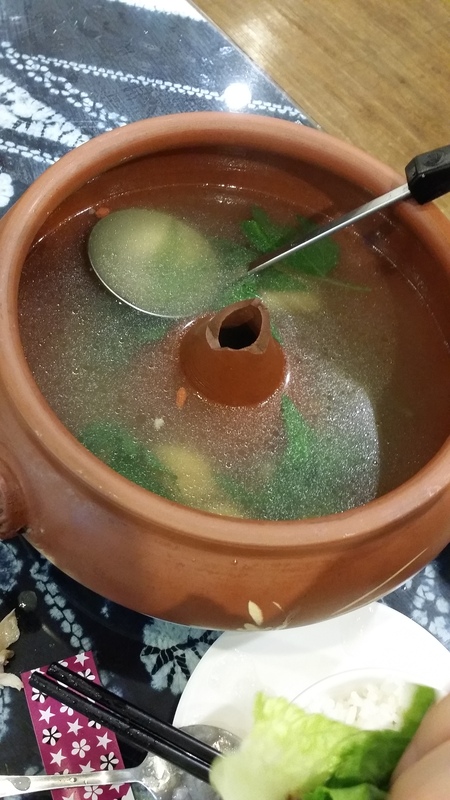 Soup-based tasted herbal but slightly bland. Excuse the lack of pictures here, but I guess you can check out that stretch for many mushroom dining places. My colleague went to an indoor one and she said the food was good. Ours was a little rundown, it was outdoors, and the weather was rather hot, plus steamboat smoke in our faces! Haha, what were we thinking?! At this juncture, drive uncle told us that his daughter just rang him and that she was arriving in Taipei soon but didn’t know how to get home from the Taichung airport (?!) so driver uncle needed to pick her from the airport instead. Thus, he pre-arranged for another driver to send us around. As ours was a 7-seater, we asked him if it’d be the same type of vehicle. Well, after our meal, the other driver came and it was a regular 4-passenger yellow cab! So we squeezed our barang barangs in the boot and ended up like sardines with 3 adults sitting at the back and a baby. Gosh! Oh well, I mean, what can we say or do, right? Dad entertaining Vera at the mushroom place we dined at. Back to Beacon Hotel to shower and freshen up, to get ready to hit Feng Jia Night Market again! HA! We spoke with this stand-in driver uncle that we wanted to go shopping elsewhere apart from Feng Jia Night Market, so he brought us to another area for shopping. I can’t recall the name, but it’s those typical night market format. Unfortunately, it started pouring just when we started shopping. The grounds were wet and shelter was limited. The men (my dad and the hub) went to purchase some umbrellas so we walked for another half an hour or so while waiting gingerly for the rain to cease. It started to get heavier, so we decided to call for the driver uncle to pick us up, and we headed back to the hotel to clean up as well as bathe baby Vera before making our way to Feng Jia Night Market for our second round of shopping plus tummy fillers! Barely crossing the road from our hotel to get to Feng JIa Night Market, someone’s eyelids got too heavy and she promptly fell asleep. Poor daddy had to stand while eating. 大肠包小肠 – Taiwan sausage wrapped in glutinous rice…. wasn’t that fantastic, surprisly the queue is never-ending but Hub says it’s because the stall owners took their own sweet time to prepare each other. Oh well! 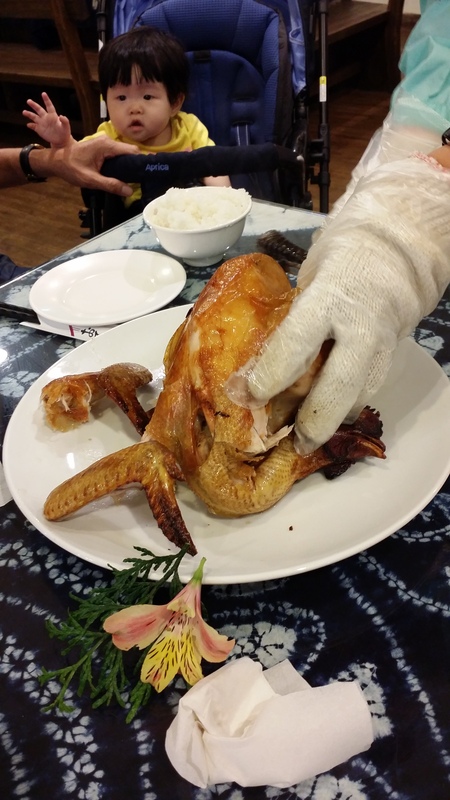 Having a sit-down dinner at Feng Jia Night Market was a good choice. Legs get to rest! Having my dose of western food at Feng Jia Night market. WHAT?! How about some black pepper meat on a hot plate for dinner? San You Ding Mei Shi Cha Ting – this was where we had dinner in Taichung. A little rowdy but at least our family could sit and rest while eating. Any room for night market snacks? YES! 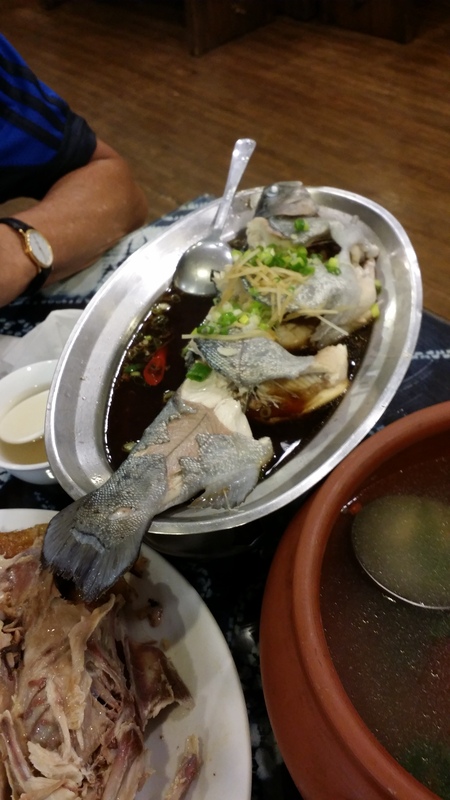 Part 2 of our Taiwan holiday itinerary can be found here. The day started with breakfast at the hotel again, and we were kinda sad as it was pretty much the same food offered. Nonetheless, after a quick breakfast, we hopped onto our 7-seater (our actual driver+car came back! LOL) and started to plan the day with him. First stop, Rainbow Village (台中彩虹眷村), where we saw vibrant, colourful walls adorned with illustrations. These murals were done by a 90-year old uncle fondly known as Grandpa Rainbow (彩虹爺爺), who was present at the site for autographs too! He beautified the walls in a bid to save the area from redevelopment and successfully turned it into a talking point and a popular must-visit attraction for tourists and locals alike. There was also a street performer – Rainbow Iron Man – who sang Chinese songs under the scorching Sun. The weather was a killer, seriously but we managed to get some postcards as souvenirs too. The star of Rainbow Village! Autographs with purchase of memorabilia. We quickly headed back to the car for aircon while baby Vera was already in dreamland! And got ready to drive to the Cultural Village. This look like a modern take on someplace retro! As its name suggests, it was all things cultural there. Traditional toys and games, exhibits, food stalls, food variety and presentation style etc were in sync. We explored Carton King, one of the places to visit when you’re in Taichung. Also, we were told that there were no admission charges here as opposed to the store at Cing Jing. To be fair, this store was bigger than the Carton King at Cing Jing. Our minced pork noodles and rice for lunch! She obviously ignored the sign… LOL! Was tricky trying to get the paper cap to stay on her head.. LOL! This paper hat won’t get wet! Gifts for the home or friends? Carton King amazes with its creative use of paper and carton. Look at that amazing carton-made art piece? How creative! THIS big carton horse can take the weight of an adult! “You’ve got mail!” That’s a letterbox made of carton! Yes, you’re looking at a fish tank there! Time to check out the Taiwan local cultural food! Look ma, there’s a train here! The place was pretty big, but it was bustling at the food areas. Look! There were even chicks spotted here. And, rabbits too! A bite of kampung living to relive those culture, perhaps? The Taiwanese really love yam! Sticky candied treats, for you? Evokes a sense of nostalgia, for sure. Is there my new ride? HAHA just kidding! Stepping into the exhibition area with more doses of cultural throwbacks. Step into a space of vintage memories! WOW! Those vintage vehicles! Have you played with them before? Haha all those cartoons, comics and popular characters! Bet you can recognise them too, right? Interesting washi tapes sold here too! Kinda random, but fits the theme here, I suppose! This is apparently TIKAM TIKAM, a childhood game we have it at the mama shops! I’ve never played before, but my husband did when he was a child. These tin robots are too cute! Simple unwind and they move too! Colourful figurines adorn this area and visitors snagging a photo moment too. Then, street performers invaded the area with loud music and a troupe of dancers and actors! This makes an interesting place to add in your holiday itinerary when visiting Taiwan. Then, we made our way to King Garden (元首館), where an English-looking establishment with giant chess pieces and a horse carriage greeted us. Several visitors were posing with these props for photo moments, and many others were streaming into the building. With the scorching weather in Taichung when we visited, being indoors was the best bet. Inside, it was akin to stepping into the confectionary section of a department store – displays of snacks such as their local favourites of pineapple cakes and tea were sitting on the shelves. There was even a bakery and that explained the crusty aroma of fresh bakes. The hub couldn’t resist it and we bought some bread to share with the family. At King Garden, All kinds of famous Chinese pastries, freshly baked! Step outside and into the mystical world of stories! Huge storybooks await you for photo moments! Make a stop at King Garden to delight in the local treats indoors, while marrying your senses with the European flavours in its architecture and external decoration. 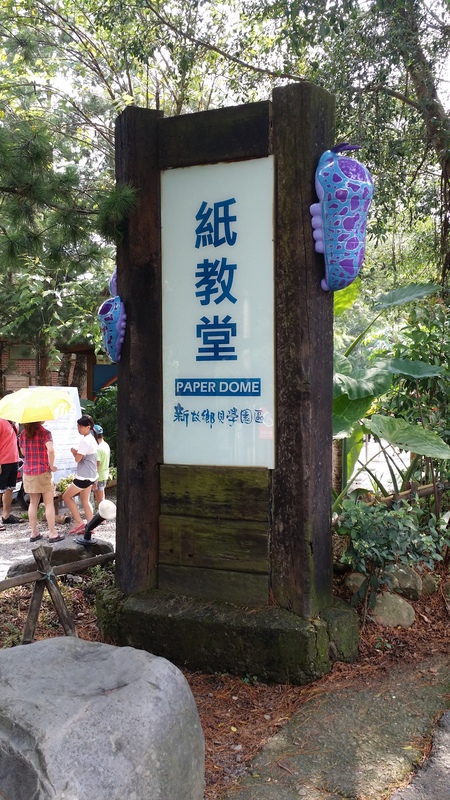 After getting some food for my colleagues, we left to make our way to Paper Dome (紙教堂). Driver uncle recommended this place as it held memories of a major earthquake that destroyed the actual church in Kobe. 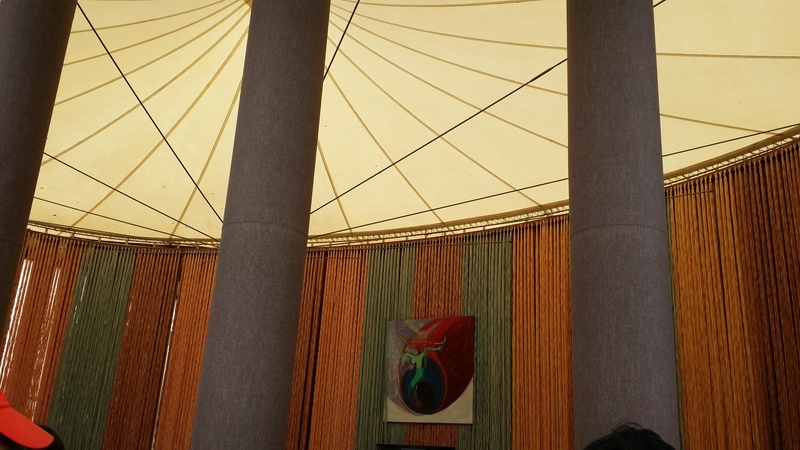 Shigeru Ban, an internationally known Japanese architect, came up with an idea to recreate the temporary church using only paper (cardboard tubes). 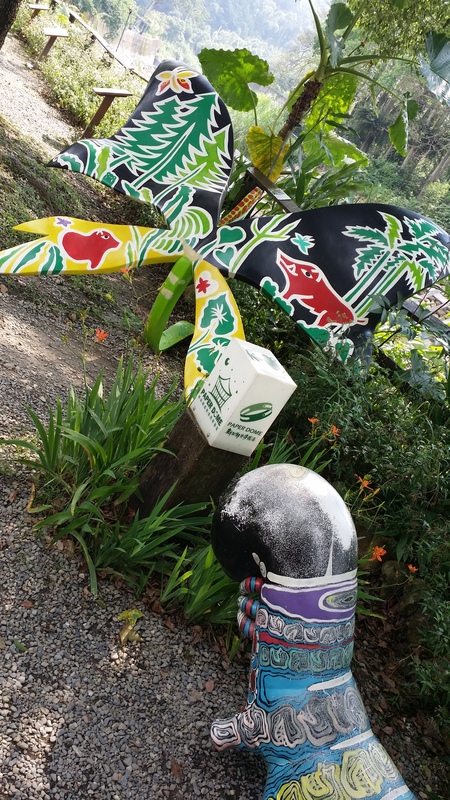 It has since been transported over to Taichung, sitting in a garden-like area which is opened to the public. NT$100/pax fee applies which can be used to offset purchases in the small shops/stalls within the area. Tip: In fact, you can simply spend that NT$100 value like money, without any minimum purchase. We got some cute hair clips for baby Vera and hand-sketched postcards from the local folks there from the shops deeper in the area. Skip the first shop you see, unless you’d like to get a drink. Look out for this sign and enter from here to head towards the Paper Dome. Entrance might seem confusing for some. Spot these colourful fixtures along the way into the Paper Dome area. 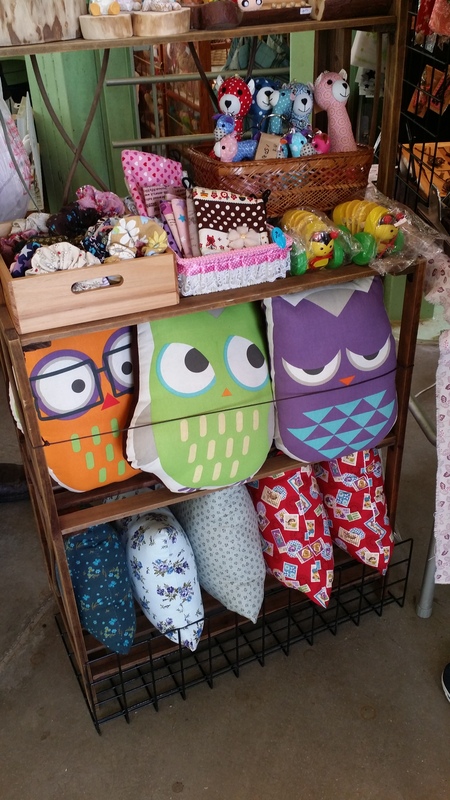 I was so tempted to bring these owl cushions home!!! Inside the church….. everything made out of paper! By then, it was around early evening, so we started to drive towards Cing Jing; estimated to take about 2 hours or so on a direct trip. Before embarking on the route, driver uncle raved about a coffee place that was very popular in Taichung. He asked if we take coffee, and it was a unanimous “yes!” from us. LOL. The best thing was, everyone gets to drink for free! Why is that? Basically, the FREE coffee and tea serve as crowd pullers (or lost leaders in the business sense), and the real deal comes from the sale of chocolates and cakes. In fact, Feeling 18 deg Café (18度巧克力工房) was generous with their cake samples too. The beat the scorching evening sun, some folks (including us!) “hid” at the bakery to stay in the air-conditioned area. If your skin is thick, you can keep grabbing their cake samples to go along with your free cup of drink. And surprise, surprise! The queue to purchase chocolates was snaking long too! The entire style of the place is clean, minimalist and pretty Japanese-inspired too. That’s the shopfront of the bakery. The queue for coffee or tea moves fast, luckily. The crowd at the chocolate area. There is indoor seating for those dining in. Choose your FREE coffee at Feeling 18 deg Café (18度巧克力工房)! How about some ‘High Mountain Tea’? Fancy some fresh bakes from the bakery? This looks just like that Japanese Juchheim’s Baumkuchen cake sold at Takashimaya Singapore, doesn’t it? Exploring the other food displays near Feeling 18 deg Café (18度巧克力工房). Bakers and service crew preparing free cake samples for visitors. Other desserts served at Feeling 18 deg Café (18度巧克力工房) in Taichung. Despite the free coffee on the other side, there was also a queue to purchase food and drinks at the other side of the road. The buzzing crowd around the cafe and more desserts! Other food kiosks near Feeling 18 deg Café (18度巧克力工房). After we finished our drinks, we hopped onto the van to proceed with our drive to Cing Jing. Our accommodation for the night was Star Villa at Cing Jing, and the town is known not to have any nightlife. Hence, before we got banished up in the highlands, driver uncle arranged for our dinner near the hotel. We fed her some rice with water (which she rejected after a few spoons of it) and eagerly fed herself baby biscuits. Typical Chinese dinner with soup and rice to go along :) Homely dishes at this Taiwanese place. My legs started to feel the chilling wind during dinner. After devouring homecooked local fare to fill our tummies, we popped over to a nearby 7-11 for food or drinks we might need. The men got some alcohol and instant noodles, and off to our mountain home! Someone couldn’t wait to practice crawling on the Super King sized bed! Toilet was spacious, housing a bathtub, and a standing area for bath beside the toilet bowl. The huge space towards the balcony and wardrobe. There’s even a round table as well. No need for aircon since it’s cool up here in the Cingjing highlands. After checking in and cleaning up baby Vera, we took turns to shower and got ready for a good rest in the uber big bed! 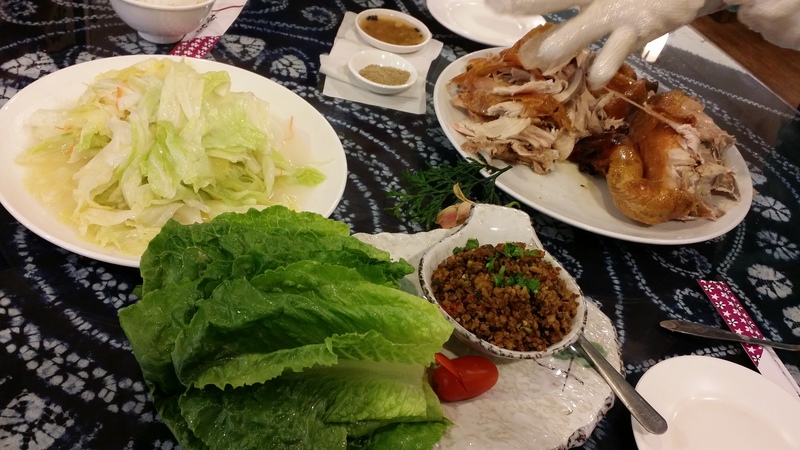 We toured Cing Jing the next day, and made an amazing discovery which many do not know of yet! Look out for the next article as we share our family experience exploring Taiwan with our baby – Baby V’s First Trip – Taiwan Escapade (Part 2)! Join us on our family adventures via Facebook, Instagram & Pinterest too! Hi, came across your blog post and liked the trip details blogged by you. Oh, do you also mind sharing on the contacts of the 7-seater car driver? Will be heading to Taiwan in 2 weeks time with 3 toddlers. Hi, would u mind sharing wif me the contact details n the pricing of the driver too if u could still remember. 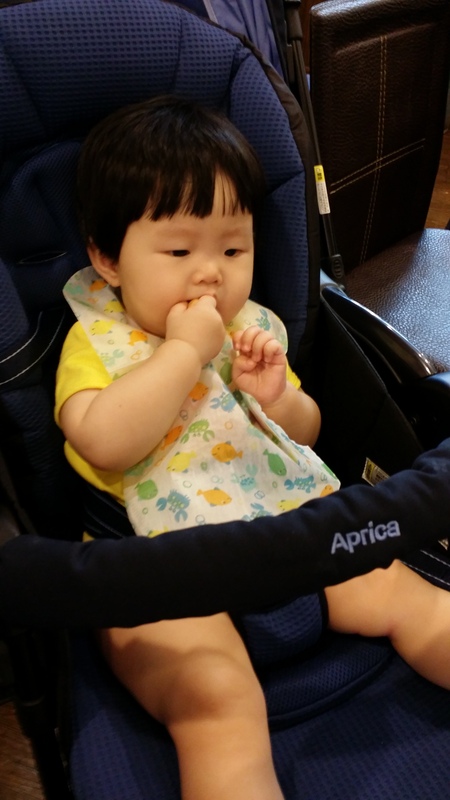 N also noticed that there’s this high chair cover u r using for Vera where did u get it frm? Baby V looked like she had such a great time there! Totally salute ur hubby for carrying such a big backpack and babywear Vera at the same time! By the way, what are the major problems you have encountered when bringing an infant on an overseas trip? Crankiness or meal feed issues? Am quite worried that our itinerary will be super delayed, having us to deal with to the 3 toddlers niece and nephews (all below age of 2) along the way. hihi, how did u manage the sterilization of the baby stuff? Did u use boiled tap water or boiled bottled water? Hi, im planning to bring my 10 mth old to taiwan soon. Thanks for your blog cos it’s our first time travelling with a baby. May i ask you for the driver’s contacts and pricing? Is he reliable? On average for your itinerary, did you have to rush? What time you left hotel in the morning usually? Im planning for a leisure one but would also like to go as many places as possible. Also, does starvilla provide baby cot? Thank you! As for the itinerary, we left it rather free and easy, and ad-hoc. So we pretty much took our time, leaving the hotel only at 10plus or 11am. Which areas will you be visiting? With your tot, it might be good to take it slow and easy, especially since there will be other stuff to lug around e.g. stroller/carrier, diaper bag etc. Star Villa was lovely, not to mention the awesome weather up there! :D We had a super king bed and co-slept and the room was huge, but you might need to ask if they do provide a baby cot. Can’t recall why we didn’t have one in our room – either they didn’t have, or my hubs just decided we should all co-sleep, since we do that at home anyway. And the rest of the cots that we requested for in other hotels ended up as white elephants. Haha! Thanks for your reply! I will be visiting mainly Taichung and cingjing for 7 nights. Will not venture out too far because will be our first time overseas. I’ll try and get another driver then… :) I would follow you to stay at beacon hotel, but hopefully can get baby cot in one of the hotels in Cingjing. Thanks again! May I know where u rent the baby car seat in Taiwan ? We got it from the driver whom was hired for the trip. They would usually be able to provide upon request at a fee. They only had front facing though. Hope this helps! Think we will be in the same situation as you, We hv 5 of us with my hub and me, my 2 kids and my mum. We are skipping all the Taishung place (quite a pity) and will head CJ Sta Villa immediately after Scoot into TaoY and HSR to TC. After which we are at a lost how to get there (from TC HSR to CJ Star Villa). I was thinking of using a 7 seaters. Heard that the uncle driver you are using is no good? How much he charge actually? Was thinking of going to somewhere along TC before heading to CJ (18 deg / England castle). What I think he mentioned his daughter call him (uncle driver) is not true, why out of a sudden during your 2 days his daughter call when his father is working. Anyway idk. Do you mind dating his name and contact? Sounds like a fun holiday coming up for you! Well we had the uncle driver for our stay in TC only as the other areas are easily accessible in a way. He was good in suggesting different places to go, I’d say. And yeah! We couldn’t quite figure out why he had to pick his daughter suddenly by citing that she doesn’t know her way from airport to home. Strange that she actually went overseas on her own then. Lol. That was the main less positive part of the service. And weirdly asking us to bring things back to SG to pass to his friend… oh well. The trip will be fun! 7 seater makes a more comfortable ride esp with kids and older folks plus the getting on and off bit :) When are you planning to go? If you’re still keen to have his contact details, i can email you separately :) Have a great week! Could you share your driver contact with me? hihi! thank you for your interesting post on your trip to Taiwan with you baby! Find it especially helpful cos we will be travelling there with my 8 month old and staying in the same hotel too. but been worried about the long ride there.. 4 hr 30 min plane ride, 20 min shuttle bus, 30 mins HSR and 40 min car ride. was it ok for your baby girl? you know how 8 months old are very kaypoh and cannot sit still now. Hehe, yup i totally understand your concerns for the seemingly long journey. But no to worry, it was actually pretty do-able! We put her in the stroller/carrier when we’re moving around. Once seated down in the plane, bus, train or car, we put her on our laps and she was pretty happy! Do keep water and snacks with you, as well as your baby’s fave toys. That would be helpful to keep them entertained :P Hope this helps, and do tell us how it goes! Hi Alicia, your post is really interesting. I’m heading to Taiwan this Oct and would like to get from you the contact of the driver. Also where did you rent the baby car seat? Would like to make sure LO is safely strapped in the car. Thank you so much! Hello Angie, thank you for dropping by! I hope the message was meant for me, as I’m not Alicia.. Hehe.. The car seat was provided by the driver as we had requested for it. It’s front facing though, as they only had this. Sure, do drop me an email and I’ll be glad to share with you his contact :) Cheers! Hi, I’m heading Taiwan with my baby. may I know where u rent the baby car seat from? Hello Angela, the car seat was provided by the driver upon request :) hope this helps! And, happy planning for your upcoming trip too! Hi, can I ask where to rent a clean and good baby car seat in Taipei? Thanks. Hello Viv! We rented it through the driver, so it was provided for when he came to pick us too :) Hope that helps! Hello! Love all your pictures of your little cutie! She’s probably not so little anymore! I will be travelling to Taiwan in Dec from California with my 1 year old. Did you bring your own stroller? What was most helpful during your trip? It will only be my husband and me. Thank you! Previous Entry Furniture Shopping Gets Easier!